There are companies and businesses in your industry that are already producing a steady stream of amazing content - so why not take advantage of their hard work? Plus, you’re doing them a favor by helping to promote what they’ve created. -What national news outlets report on issues related to your industry? Local news outlets? -If issues related to your industry aren’t reported by the regular news, is there a company or site that has set itself up to report on the news in your industry? -What are the top print publications in your industries? Think magazines, newsletters, and periodicals. While these might be print sources, you can bet they probably have some resources online that you can tap into and share. -Who are the influencers in your industry? Now, you might not be ready to do influencer marketing, but keeping an eye on what influencers are sharing can often lead you to other sources of relevant content. Or you may want to just share the influencer’s content directly! -Who are the top bloggers in your industry? People with top blogs have top blogs for a reason…because they publish great content! -Who are the top Youtubers in your industry? Youtube is a great place to find and search for video content on almost any topic! -Are there any professional organizations or boards in your industry? You don’t necessarily need to belong to them, but making a list of all these governing bodies can lead you to more content. Most professional organizations will publish their own blogs or reports on a somewhat regular basis. -Are there other industries that are tangentially related to yours or that have cross-over potential? If so, you’ll want to repeat this list of questions for that industry. Here’s an example of what I mean: the interior design industry and the real estate industry play well together because they’re both focused on homes! -If your business is concerned with things that happen on an international scale, you’ll want to keep an eye on what’s happening in other countries…which means repeating this list yet again! Once you’ve located all these sources, subscribe to their blogs or sign up for their email lists. Depending on how much time and effort you want to expend on this strategy, you should be able to find at least ten quality sources of content. You can obviously go as hog-wild with this as you wish! 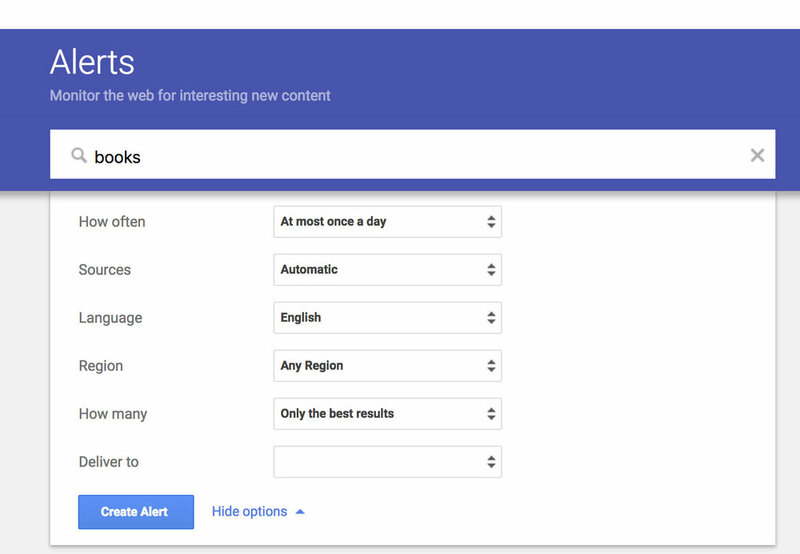 In addition to subscribing to all of the above resources directly, you can also set up Google Keyword Alerts for specific keywords. You’ll need to have a gmail account for this, but they are free and easy to set up. You can set up a Keyword Alert for almost anything you can think of! A word of advice: make sure you expand the options when you go to set up your alert to control the frequency of delivery and the region. There are more options located under “Show Options” but these two items will make a big difference in the quality of the content you get back and your sanity. I’ve included a screenshot below to show you what the expanded menu looks like. While this might not be appropriate for every industry and business…meme pages are a great way to find viral photo and video content! These pages constantly deliver the juiciest content and if your industry is a niche interest, you’ll likely find at least a few gems your audience is certain to like. While this may seem like a cop out and a waste of your social media page, I want to remind you about a nifty little feature Facebook and Instagram have: that glorious tag a friend feature. How many times have your scrolled through your own feed and either tagged a friend on a post or sent them a screenshot of what you saw? Now just imagine that’s YOUR page! While the past three items are more actionable, this fourth item on the list is still a good one to mention because it’s a very trainable skill. As you go about your day, try to keep the thought in the back of your mind that you are looking for content on a specific topic and watch what shows up. There have been times I’ve been driving and listening to NPR when I suddenly hear a report that would be good to share. While I’m browsing Facebook, I’ll often see things I could use for my clients or that I want to review in more detail later on. When I find something “in the wild” I try to email myself the link or at the very least send myself a note to look for it later. Now I’ve just gone through HOW to get content flowing to you, but I haven’t yet covered where we’re going to have all this content flow TO! My best and easiest recommendation is just to set up a separate email to house all this content. And I would suggest you set up a Gmail since you can easily apply those keyword alerts I mentioned above! See how nicely that worked out?! And no need to have this inbox forward to any of your accounts. It’s better if you don’t because it’ll keep your already overstuffed inbox from overflowing and ensure you don’t miss anything important. Just create an action item for yourself to check this other email once a week or however often you sit down to plan out your content for your social media accounts. What are your best tips for curating content for social media? Leave me a comment below, I’m always interested in learning new tricks!